How to Get Started with Scrum in my Company? How to Get Started with Scrum in my Company? Scott Dunn, CEO of Rocket Nine Solutions answers this question from a passionate agile with Scrum methodology perspective. If you are trying to use Scrum at a larger company with 5, 10, or more teams, the Scaled Agile Framework can help with coordinating larger Scrum adoptions. Management usually wants to know where existing roles will plug into an agile methodology. We start with management training, including HR as well as upper and middle management so they understand their role in supporting an agile transformation. Who is your Scrum or agile evangelist? Who is passionate about adopting agile and will spearhead the good, important, but difficult changes ahead. What’s the funding? What level of priority is attached to this effort? If the dollars for training and coaching aren’t there, success gets much less likely. 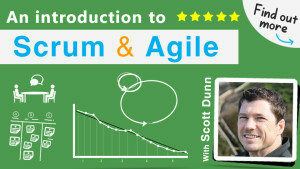 For more information on Scott Dunn, Rocket Nine Solutions, or the agile Scrum methodology courses we offer, please visit our about page.